Inspired by Emily of Nerd in the Brain here are my Three Things Thursday. First, apple blossom. We returned from our holiday to find our tiny apple tree laden with blossom. The cold north winds in our absence had not damaged it and there is the promise of a good crop again this year. Second, making vaarks. The Sixty Million Trebles group is currently raising funds for the charity Hand in Hand for Syria. Lots of the ladies have admired the little sock creatures designed by Danielle (pattern available here) and so I have made a few that have been snapped up very quickly in exchange for a donation to the charity. Not only is this raising money, it’s also helping me deplete my stash of old socks! I’m going to have a break from making them for now, as I don’t want it to be a chore, but these were fun to do. Third, (more) stash-busting. I had a big bag of cotton yarn that I bought a couple of years ago for making Knitted Knockers (at the time the knitters bought all the yarn; now they have the funds to purchase yarn to supply their knitters). For logistical reasons I’ve stopped knitting for this particular charity, but still had lots of yarn. I sent KK some whole balls of yarn a little while ago, but I still had many part-balls and a couple of full balls left in my stash. So, I decided to use this for a charity blanket. I’ve made a dent, but there’s probably going to be enough for a second blanket! So, those are three things making me smile and for which I am grateful. What has made you happy this week? No one leaves a cake out in the rain in this house… they are far too much in demand. However, yet more rain this weekend kept us indoors (mostly). Much of my time has been spent in the kitchen, where it’s warm and the smell of cooking is comforting. As the chilli harvest just goes on and on, with more ripening up every day, I decided to make another batch of hot, sweet chilli sauce. I made double quantities this time, so that used up about another 50 chillies and even so we have loads left. I did see reference on the internet this week to the health-giving properties of capsaicin (the source of ‘heat’ in chillies), so it’s not just yummy (if you like that sort of thing) but good for you too. My cooking produced some things that I make regularly: granola (although with dried cranberries this time… never let it be said that I can’t be festive when I want to) and dog biscuits. Making the latter has been much simplified and the cost reduced by finding a source of medicinal charcoal powder, rather than having to crush up charcoal tablets. Then I tried a new recipe – apple brownies – which did not really work as brownies, being rather too soggy, but did taste delicious warm with cream as a pudding. We had comfort food on Saturday evening: baked gammon with bubble and squeak and cauliflower. This was served. of course, with hot sweet chilli sauce! In fact, I had ulterior motives for cooking the gammon: I wanted to have a go at making Shropshire Fidget Pie. which I did on Sunday. My interest in this particular pie was piqued when we saw them for sale in The Ludlow Food Centre… mainly because of their amusing name. But then I found a recipe whilst browsing my cookery books for interesting things to do with apples. And finally, a pie-related discussion with Helen over at the Beastie Blog (a couple of the Beasties are pie-makers) finally roused me to having a go myself. It appears that there are many versions of Shropshire Fidget Pies: completely enclosed pies, pies with a pastry base and topped with mashed potato, pot pies, pies containing various condiments, pies with a creamy sauce, pie with added cheese… In the end I decided to make a relatively simple pot pie type (i.e. with just a pastry top). 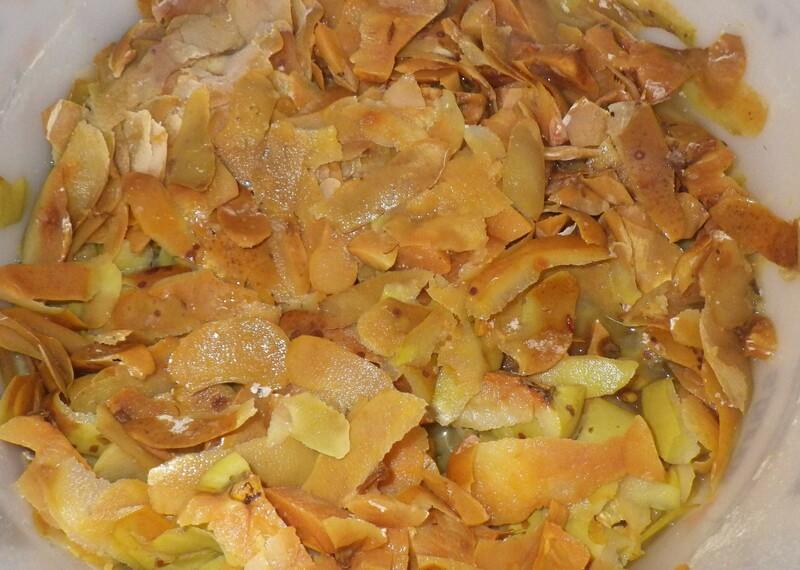 It consisted of layers of sliced potato, onion, apple and baked gammon, with cider added to provide some liquid. I topped this with shortcrust pastry and glazed it with beaten egg. Of the filling ingredients, only the ham is pre-cooked, so it has to be baked for quite a long time (1 hour and 20 minutes). We ate ours with the remains of the bubble and squeak… and very good it was. In future I would be tempted to pre-cook the filling and create more of a sauce to make it moister, and so that the pastry is in the oven for less time. Apart from these minor tweaks I think I shall be adding this to my repertoire… especially since we can get such amazing, local, ethically produced ham and gammon from Sarah Rose and her company From the HedgeRose. So, those were my recent culinary adventures… have you had any? I’m away for the next few days, but I” be back at the weekend. 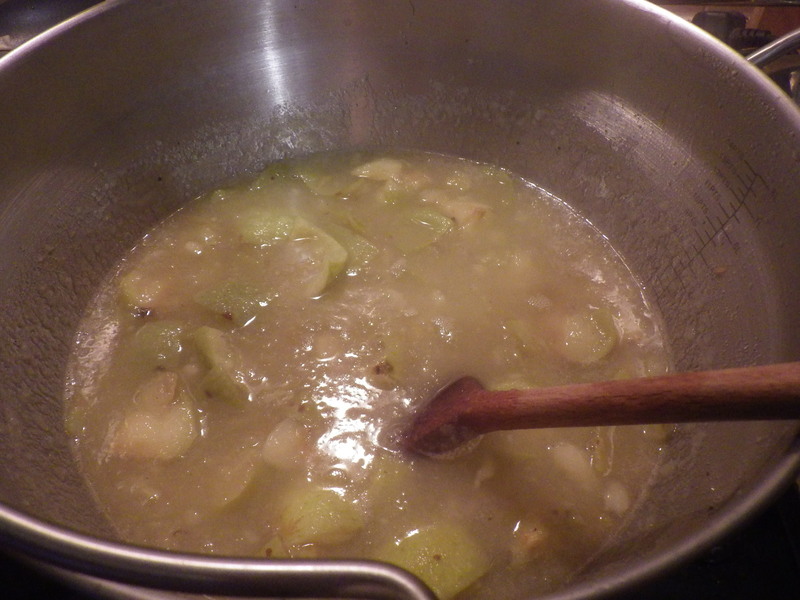 Since I still haven’t worked my way through all the apples I brought back from Herefordshire (despite continuing to bottle them), on Monday night I decided to make apple and pie-melon chutney. You will notice that I have now decided to use the Australian name for my Curcurbita ficifolia. This is because (1) I never have any intention of making Sharks fin melon soup and (2) the name ‘pie-melon’ is just so much nicer*. In addition, since narf gave me some great links (see her comment with this post), I’ve decided I’d like to carry on the long Australian tradition. My pie melon… is it ripe? Actually, there seems to be some debate about the actual species that constitutes ‘pie melon’: in some places these are Curcurbita ficifolia, like mine, but elsewhere the name refers to Citrullus lanatus var. citroides (a sort of ancestral water melon with red seeds and also known as citron melon). In both cases, the fruit is pretty bland and I think can be used for similar purposes, hence the confusion. 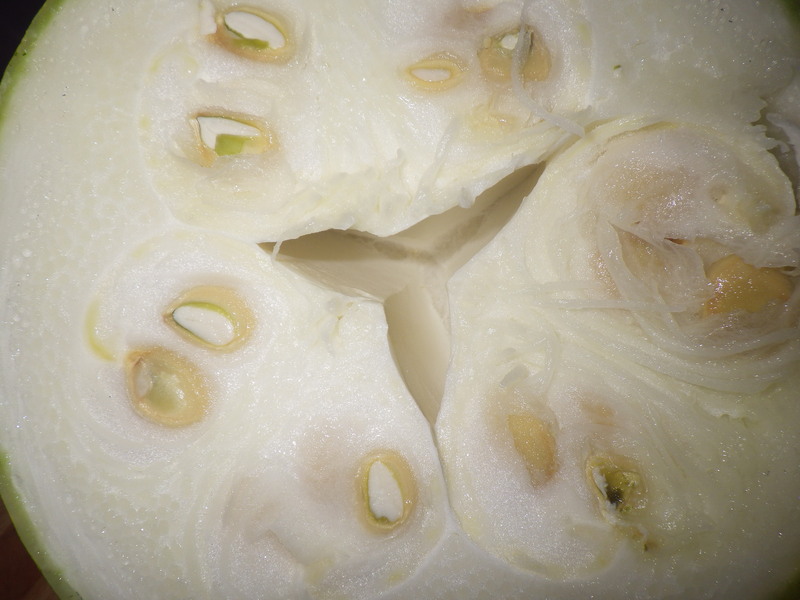 It appears that Citrullus lanatus may have softer more glutinous flesh, whilst Curcurbita ficifolia has tougher flesh with fibres. Both seem to store well and there is some suggestion that they ripen in storage, so I will definitely be keeping some of mine to see how they change over the months. Having said that, all of mine are still growing in the garden apart from the one harvested last week. Anyway… having discovered that I might be able to use my Curcurbita ficifolia glut for preserve-making, I decided to explore the possibilities. We don’t eat very much jam, so there seems little point in making large quantities that will simply sit in a cupboard for ages. However, we did enjoy some apple chutney that we were given last year (delicious with Glamorgan sausages) and so, I thought that this might be something worth attempting. I consulted various recipe books and settled on using the general one from River Cottage. Hugh Fearnley-Whittingstall calls this glutney because you can use it to make a chutney from whatever you have an abundance of…. and for me at the moment that is apple and pie-melon. The choice of recipe was also was partly based on the fact that I’m not a big fan of vinegar-based preserves (I really don’t like pickles) and this recipe seemed to use an acceptable amount of vinegar. I chose cider vinegar because of the apples, but also because it is, to my taste, quite mild. Basically, I chopped all the fruit and veg and the dates, then put everything in a preserving pan, brought it gently to the boil and simmered it (uncovered, stirring occasionally) for three hours, before potting it up in hot sterilised jars. In order to avoid the house filling with vinegar fumes (as happened the only other time I tried to make chutney… mango, sometime in the last century) I had the extractor hood on over the cooker all the time. The resulting chutney looks like bottled rhubarb! I had a little taste and it seemed ok, but it needs to mature for a couple of months before it’s ready to eat… I will report back. 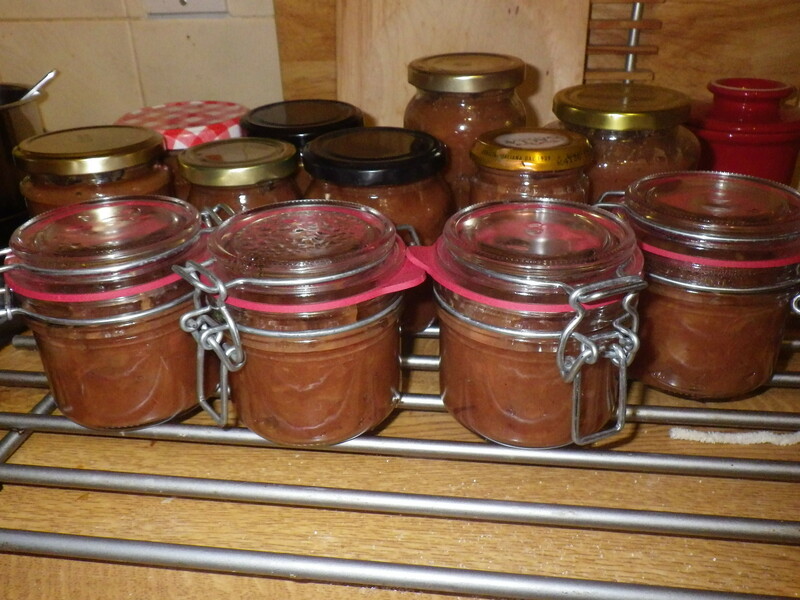 Lots of jars of chutney… I wonder what it will taste like! * It does, however, mean that my previous post should be re-titled ‘Pie attack’… which I’m not convinced has the same ring! I have a confession… I’ve bought another a new gadget. It’s something that I’ve wanted for several years now, but have been unable to buy in the UK. Finally, however, thanks to the ‘global shipping programme’ available on a certain on-line auction site I was able to place an order from a seller in the US and pay all the import duty and shipping up-front for a very reasonable price. 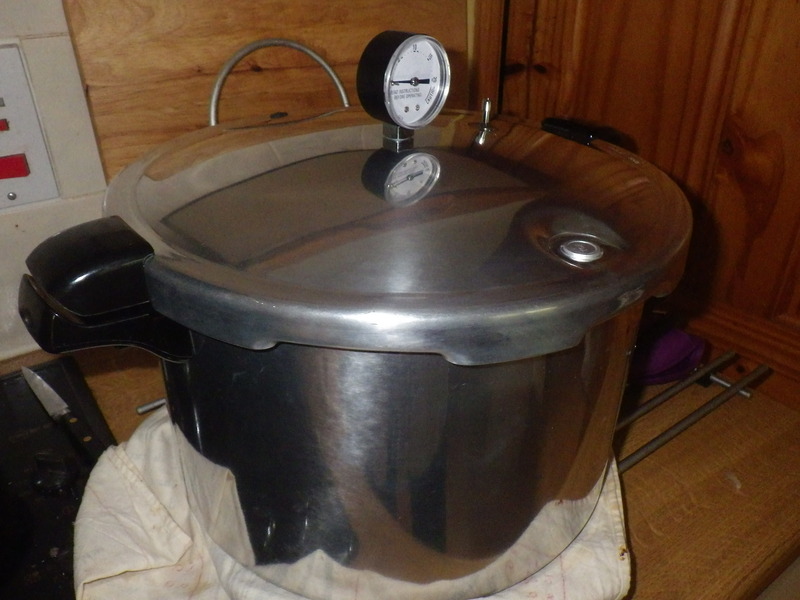 Hey Presto – a pressure canner! It was described on the Presto web site as an ‘entry level’ canner, since it only has a capacity of 16 quarts (US), but it’s certainly ample for what I need. Selecting an appropriate model took a while since I needed one that I could use on a ceramic hob. In addition, I had to read around to discover whether there was a difference between a pressure cooker (for sale in the UK) and a pressure canner (not for sale in the UK as far as I could find). It turns out that a pressure canner has a gauge so that you can maintain it at a specific pressure for a specific length of time (you can read more here). One of the joys of Mr Snail being in a big city is that I can send him off on a quest during the week. Having failed to be able to find any in Aberystwyth (well, what did I expect? ), I set Mr Snail the task of buying me some jar tongs last week. First of all, I had to explain to him what jar tongs are and then I had to send him a picture because my verbal description was clearly woeful (either that or he just doesn’t have the capacity to visualise such things). 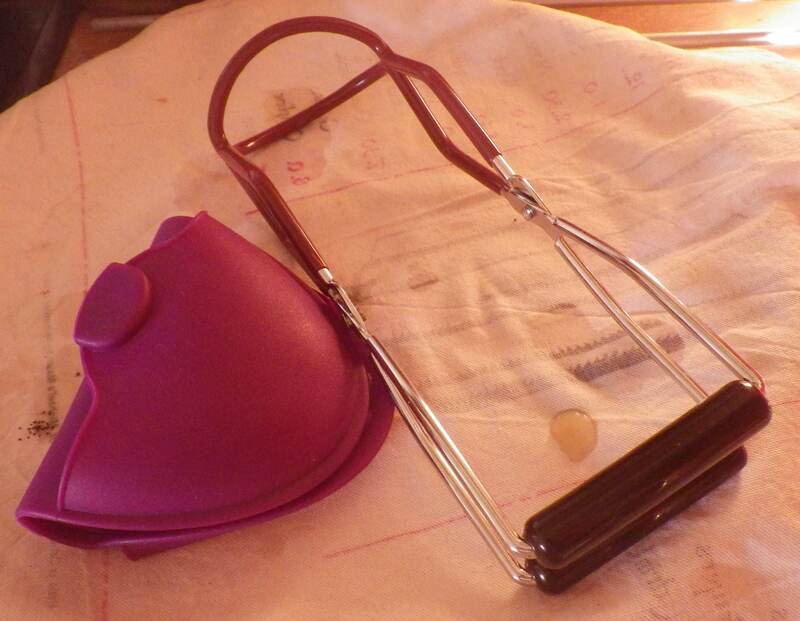 Anyway, a picture was sent, a comment was received about it looking like some sort of surgical appliance and off he set to seek out what I wanted. In fact it only took him three shops, one stock search and one helpful assistant before he was able to splash out £4 on what he thought, and indeed was, just the thing. 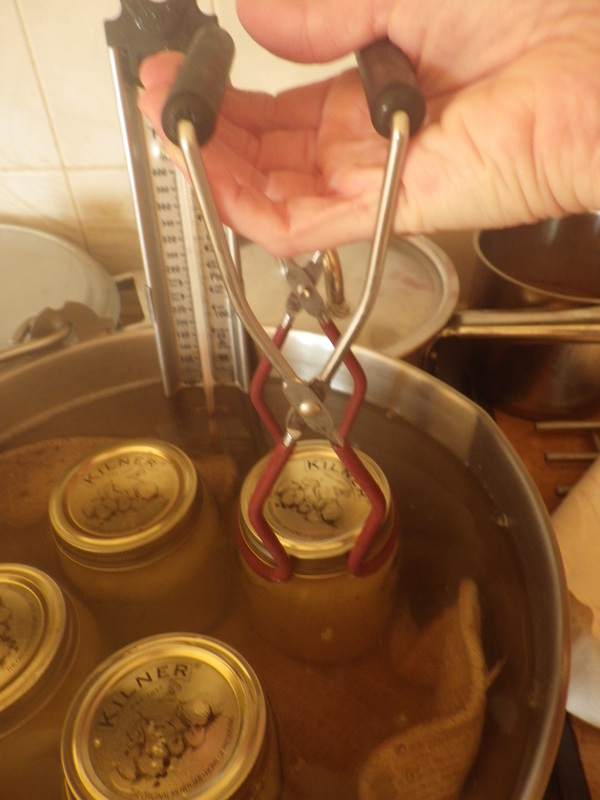 Jar tongs, in case you have never encountered them, are designed to remove preserving jars from pans of hot water. For some years now I have, however, been struggling without a set and thus getting boiled fingers. But no more… my preserving activities are going to be safe and scald-free from now on. Of course, we went to Lampeter on Saturday and found jar tongs in our favourite hardware/housewares shop for 40p less! Mr Snail was not impressed, but did buy me another useful jar-gripping gadget – a little non-slip silicone mitt that is waterproof, so can be used to hold wet jars, spoons and lids without hot water seeping through. I was delighted even if he was still grumbling a bit. So now I’m making further progress with apple processing. 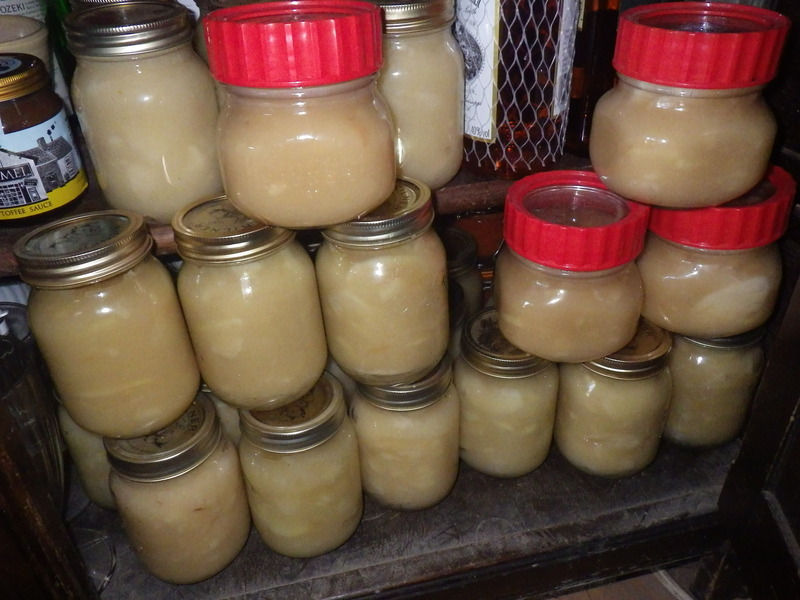 Other things do keep getting in the way (paid work, for example) but so far I have bottled up 7.5 litres (about 13 Imperial pints or 15 US pints) of stewed apple, which should keep me going for a while. There are still plenty more apples awaiting attention, so the jar tongs are going to get a really good work out over the next week or so… don’t you just love having the right tools for the job? I am very lucky to have some generous friends at High Bank near Ludlow who share their apple harvest with me every year. In return I always give them some of my surplus vegetable plants and, this year, I’m supplying them with willow cuttings too. This wonderful harvest does require me to go and visit – a drive of a couple of hours. So, today I packed the car with receptacles for apples, willow cuttings and dogs and set off for a lovely day out. I forgot to take a photograph at the beginning of the day before our departure, but I did mange to remember to take a few pictures later. I set off at 8am and drove through beautiful sunshine here on the coast and over the mountains, then thick fog and finally more sunshine before arriving in Herefordshire. Once there, I enjoyed coffee, homemade soup, an interesting discussion about home-schooling (something I really support) and lots of apple-picking. I certainly know how every spare minute is going to be spent over the next couple of weeks… I’m just concerned that I might need to invest in a new peeler! A day of sunshine… and there has been no rain for 34 hours so far!! This respite in the weather has meant that we could get on with some outdoor activities today. We walk the dogs almost every day, just avoiding the very worst of the weather, but today’s walk took much longer than usual, because so many other people were out too. In our community that means stopping for a chat… and getting given sweeties by the wife of one of our local farmers! 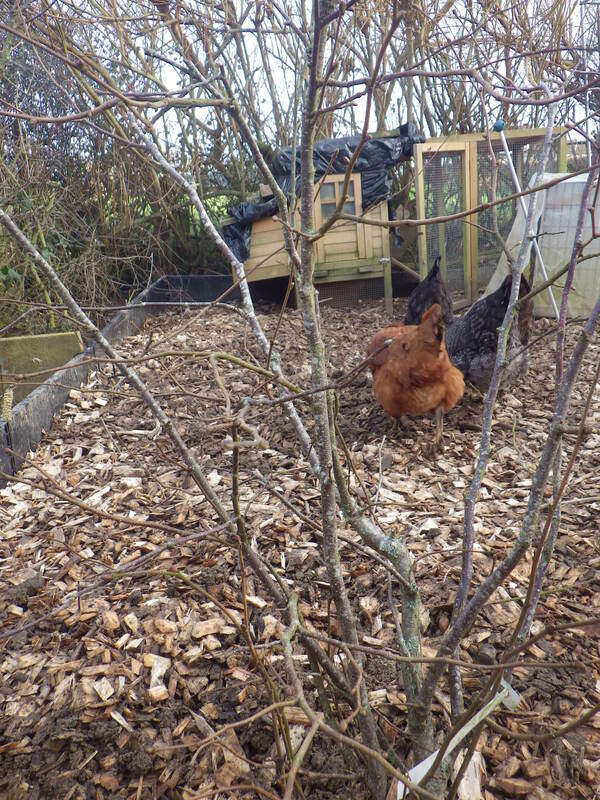 Once home, we were able to allow the hens into a part of the garden that has simply been too wet for them recently. We want them to clear and fertilise some of the vegetable beds in anticipation of the growing season. 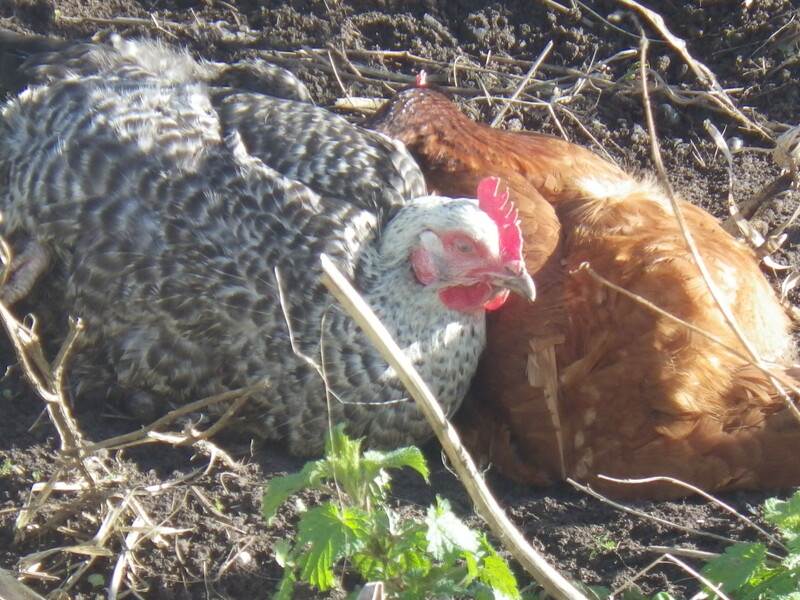 Of course, as soon as the soil dries out a bit, they want to have a dust bath… I think it was more of a wallow today, but they seemed to be enjoying themselves anyway. 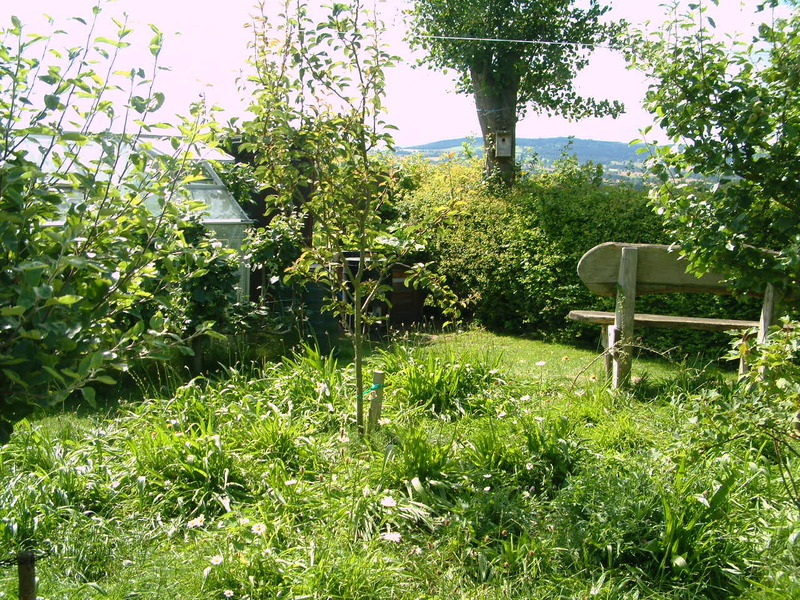 Whilst they were busy on the vegetable beds, I was able to plant two trees that have been awaiting my attention. In the chicken’s main patch, I want to create a more woodland-like habitat (after all they are descended from jungle fowl) and I was inspired by the area in which Wade Muggleton keeps his chickens at Station Road, which has fruit trees. We do not have ground vegetation at present because of having to raise the level of the soil to stop the waterlogging, but now that we have solved that problem, I wanted to get started with a Kentish Cob and an apple tree. Cob nut in the foreground with the chickens foraging behind. The Cob (a variety of hazel) has been in a pot for a couple of years, because it originally arrived at a time when the soil was frozen so solid that we couldn’t plant it. The apple, however, came very recently from my dear friends Janta and Merav at Karuna – the variety is Ashmead’s Kernel and it’s grafted onto a dwarf rootstock, so should be perfect for our little garden. Both are now planted and will hopefully provide a great habitat for the hens and a harvest for us. 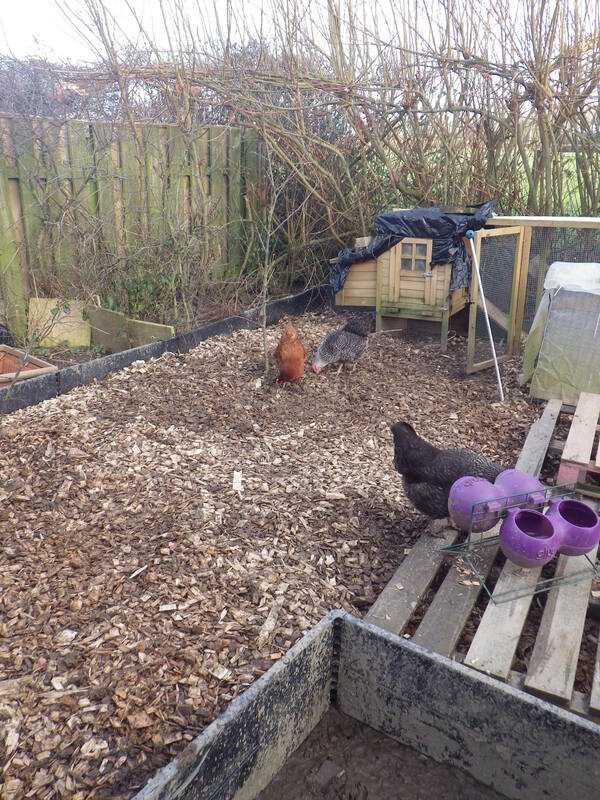 Don’t be fooled by the woodchip on the surface in the pictures, it’s lovely and fertile underneath from the chicken droppings that have been slowly incorporated into the soil over several years. About a month ago I started making apple scrap vinegar, and I can report that the process is going well. The idea was to find a use for apple peel and cores rather than simply putting them on the compost heap (although that is not a bad use in itself). By making vinegar, however, I am able to obtain an additional yield and still have compostable material… three outputs from one resource! It’s good to be deliberately making vinegar – I have done it inadvertently in the past, in the days when I used to make my own wine! 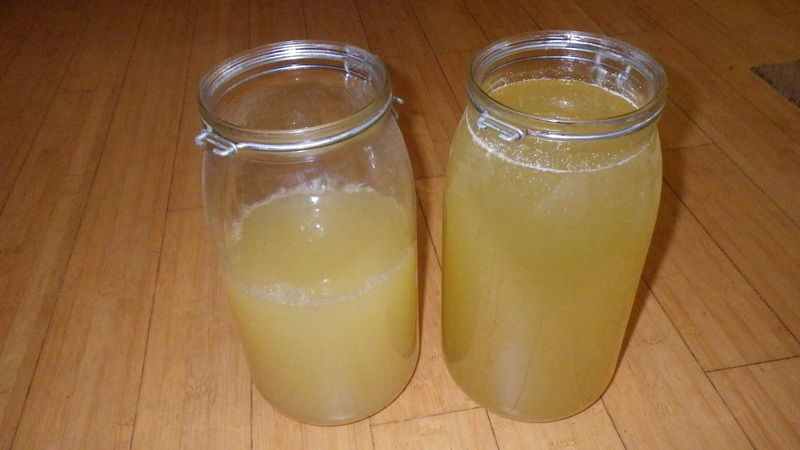 Having added some sugar-water and allowed the scraps to ferment naturally for a few weeks, yesterday I strained the liquid off and put it in a couple of large glass jars. It’s fascinating that the mixture had not gone mouldy, but naturally occurring yeasts had caused the fermentation (you don’t add any brewers yeast). I could have allowed it to ferment for a bit longer, but I need the space that the bucket was occupying, so I decided to move on to this next stage of the process. 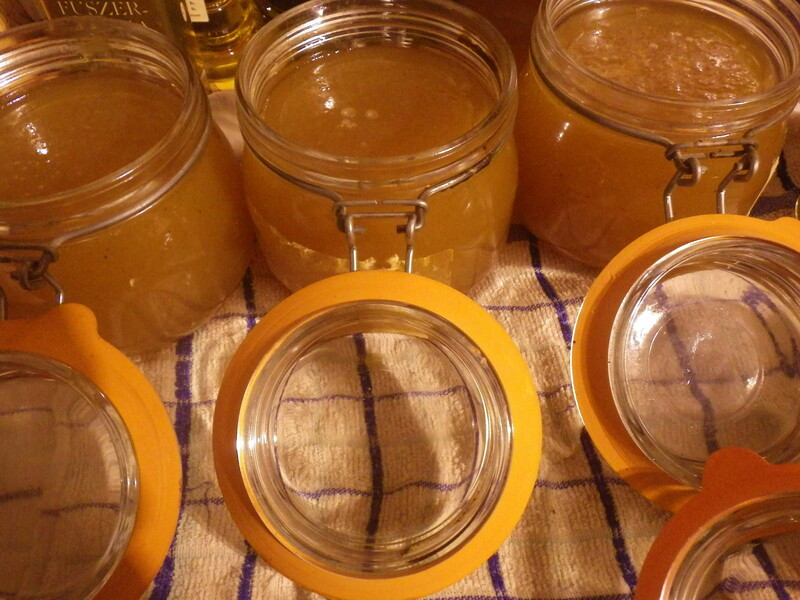 I covered the large jars with cloth squares (lovely colour because these are off-cuts from the kitchen curtains) and transferred the jars onto the dresser to allow the liquid to continue its progression towards apple vinegar. Apparently I can now leave it for between two weeks and two months before it’s ready for filtering through a fine cloth and then it can be used directly or pasteurised to allow me to store it. The fermented apple scraps cannot be fed to the chickens (I really don’t want a drunken ‘hen party’ outside my bedroom window), so they have gone straight onto the compost heap. In fact the girls have not been missing out as they’ve had lots of scraps whilst I’ve been processing more apples for the freezer… there’s a limit to the amount of apple vinegar that a girl can make use of! 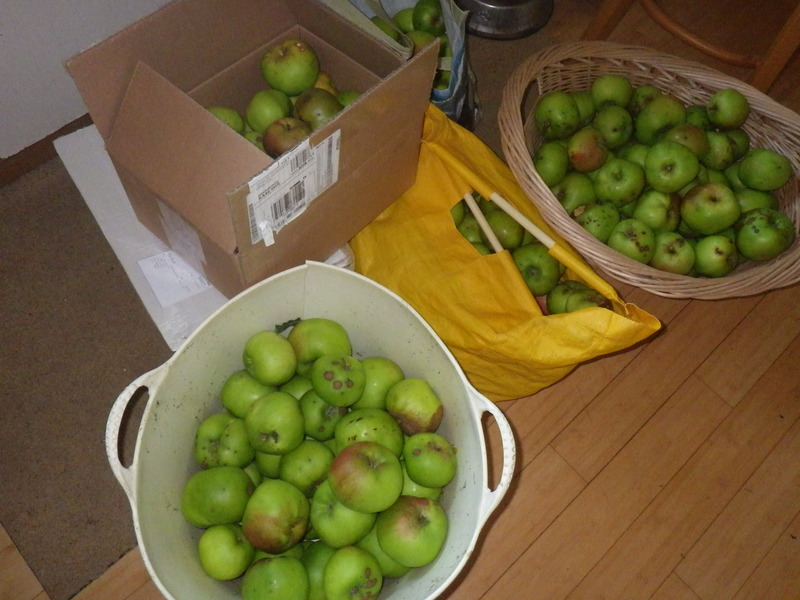 I still have lots of apples to process, even though I’m still on the first batch that we collected from High Bank. However, today I have decided to make a preserve that does not require lots of peeling and coring, but does require cider – apple butter. It’s a really easy preserve to make. Simply roughly chop 1.5kg of cooking apples and simmer these gently in 600ml cider (medium or dry) until it’s all cooked to a pulp. The next bit is the biggest fiddle – you need to pass the pulp through a nylon sieve to get a lovely apply puree. Measure this and return it to the cleaned preserving pan with 340g of ordinary granulated sugar for every 600ml of puree with the spices of your choice – today I added half a teaspoon of cinnamon. Warm gently to dissolve the sugar, then boil vigorously for about 15 minutes before transferring to hot sterilised jars. 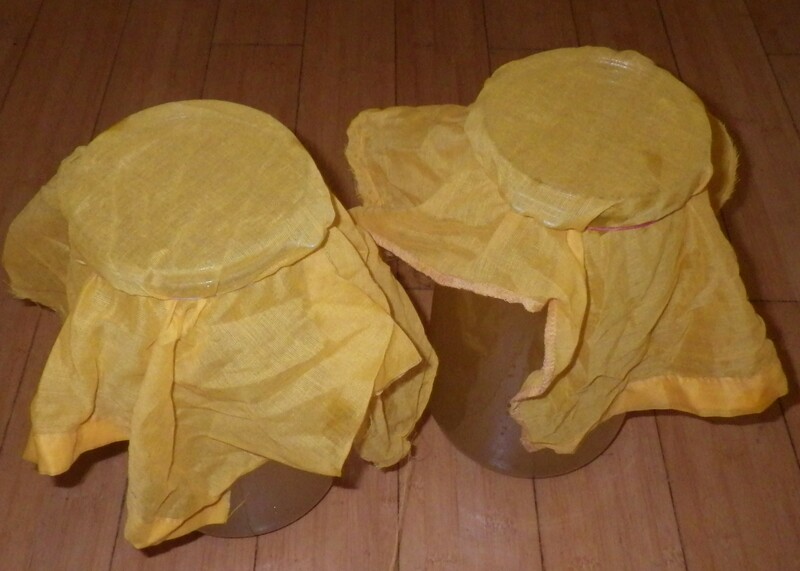 Once filled, cover the open jars with a tea towel and allow them to cool before sealing. Delicious in a cake, on scones or on toast.